When I begin writing, I always contemplate where to begin the story. In between long flights, many buses and countless trains, the monotony of the untold occurs. I'm a rare breed in that I thrive in airplane seats, washing myself in toilet stalls and surviving the hours and hours it takes to get from destination to destination. I suppose my story began before all this, beyond the beautiful. It began in a time before 9/11 and security checks, when I was a child and my father would take me to the airport to stare out of the windows at the Toledo airport to watch the airplanes take-off and land. Travelling to India wasn't even in the realm of possibility growing up. Even visiting London seemed exotic and only a place that "rich people" visited. That child who dreamt of far off lands grew up but never really changed. She still travels with a sense of childlike wonderment, always peering out through the window as if it's the first time. I'm always celebrating how travel is mesmerizing, beautiful and part of who I was, am and will always be. Interestingly, due to a recent demonetization of currency in India, larger bills such as the 2000 rupee note are rarely accepted anywhere. Unfortunately, currency exchanges in the U.S. only accept and provide these larger notes. (I still have tons of 100 note rupees I can't exchange here in the U.S.). Finding smaller currency to pay for the bus is almost impossible at the airport at 5 AM, but I was lucky enough to find a gentleman that aided me in my endeavor as he took pity on me that morning. "India is tough", he told me as he made me recount the twenty 100 rupee notes he traded. I was neither worried nor feeling anything was "tough", though I'm certain this airport has seen numerous frantic westerners boggled by the inability to pay for things. Just as there are those with no fear of heights, the common perception that western travelers have a sort of "culture shock" upon arriving is absent in me these days. It's a beautiful day in #bangalore. With money in hand and having extracted Shannon from the coffee shop, we headed off to the public bus to begin our journey into city center. I was feeling relaxed and euphoric as one of the most beautiful sunrises occurred. About an hour and half later we arrived in the middle of Bangalore. I remembered Russell Peters, a Canadian Indian, remarking on the smell of Delhi in his stand-up routine, but I found nothing that resembled that here in southern India. The trees smelled of floral scent, wrapped in spice with a hint of petrol from the rickshaws, colloquially called autos. Leaving the bus stand, a shady rickshaw driver approached us for a ride. I explained where we wanted to go, a hotel on Richmond Road called the Melange Astris. Having spoken in detail with my friend Aditi who lives in Bangalore, I knew that we should ask the driver to use the meter, which he agreed. However, this is where our learning curve began. The meter did not function. Our driver was an unlicensed, underground rickshaw driver who stayed off the main roads and dodged the direct path to entice a high fare. None the less, it was a incredible first experience of cows in the streets, kids running barefoot through neighborhoods and vendors and shoppers in the early morning hours of Bangalore. 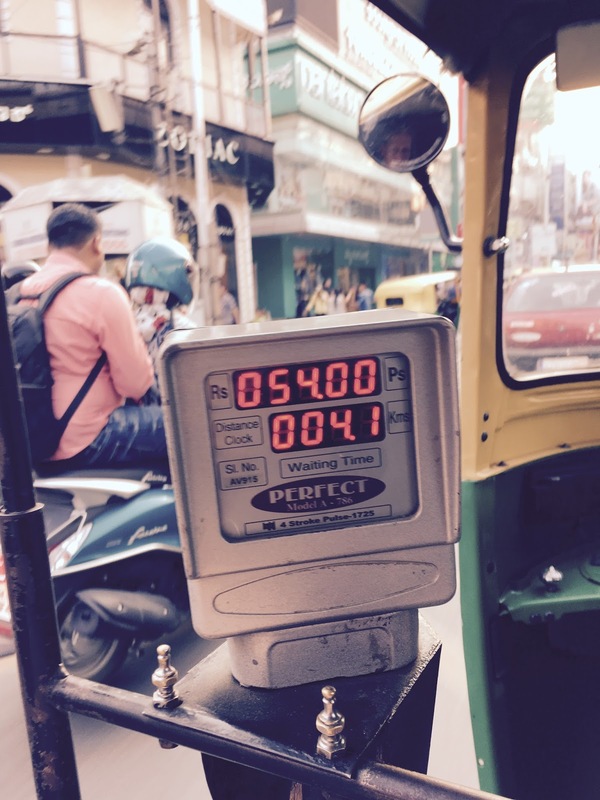 Upon arriving at the hotel, the driver demanded 500 rupees (a drive that should have costed about 50). I gave him 100 and told him to scram (in the nicest way), though he contested. "But it's 13 kilometers", he replied, lying. "Would you prefer nothing? ", I asked. I had successfully beaten corruption at the ground level as we walked up to the hotel. I would later learn from Aditi, to always make sure the meter works. Even then, some of the meters have been tampered with, but generally anything within the city is going to be under 100 rupees (typically 50 or less). You can of course use Uber or Ola, if you have a working mobile phone, which we didn't. Even when we did, a few days later, Uber banned us from their service for no apparent reason. After checking in and showering we headed out into town to grab some great street food and juices. Juice stands are everywhere and perfect when the temperatures are 97 F (36 c). The fruit and juice in generally are unlike anything you'll have ever experienced in the U.S., hand squeezed, fresh without chemicals or preservatives. I had a banana that literally changed my life. Everywhere you go there's food and it's mind boggling cheap. We're talking drinks and food for maybe $1-$2 USD for both of us. You can literally try almost everything and never break the bank. We spent most of the day wandering around town. Visiting MG Road, the infamous location of the recent female molestation that occurred in India and widely reported on news outlets. Having been to Egypt as a white woman, I'm used to special attention. Touching tends to be common, but I found that none of this occurred in India. In fact, it was completely the opposite. It felt safe and secure and relatively little attention was given to the fact I probably stuck out like a sore thumb. Part of this, likely due to Bangalore's technology sector (the Silicone Valley of India) which is booming, creating a melting pot of ethnicity and diversity from around the world. There's a bad joke in Bangalore that if you cast a stone in the city, you're likely to hit either a dog or a software engineer. Every month there are ten new startups in Bangalore which constantly shifts the dynamic of a city that serves as the hopes and dreams for millions in India. American journalist, Thomas Friedman, remarked that Bangalore is when he first realized that "the world is flat", a place where opportunity and equality is afforded to all should they wish to simply participate and "compete". Indeed, Bangalore feels very western in so many ways. By nighttime we ended up at Sodabottleopenerwala, an upscale restaurant on Lavelle Road for a perfect dinner that included Iranian faloodas (cold and sweet noodle drink), biryiani (rice and meat) and a take-home bag of cheesecake. It would be easy to mistake such an establishment as being in New York or Los Angeles, but this was India. It's one of Bangalore's top restaurants but costs lest than $40 USD per couple (probably our most expensive meal). It was the perfect end to the day, made even better by the beautiful walk home under a romantic star filled sky on the tree lined boulevards of the city. Earlier that day we had landed in Kuwait, transitioning to India. It was there while boarding a Kuwait Airways jet to Bangalore, I realized I'm not your normal traveler. I couldn't wait to get my feet dirty in the streets of India. Most people crave that which is safe and secure. Most people like to know they have a ride from the airport and what their day will become. For me, I love to let it unfold in the most mysterious of ways. Bangalore for the uninitiated is a sanctuary for those of us who are not intimidated by happenstance and love the thrill of what's around the next corner. For many westerners, India may feel distant or foreign, but that night, to me, it felt like home. I've always considered where I live in North Carolina as one of the most beautiful places on Earth, but I was quickly reconsidering this position as I opened our hotel windows to lush trees filled with birds and I could literally feel the heartbeat of the city. Bangalore is a city that is always changing, always moving, always dreaming. The city's kindred spirit, not unlike that of myself as a child, staring out at the runways in Toledo Ohio with my father, wondering where life will take me next. Somewhere beyond the beautiful.